Get Wyoming Mail Forwarding Today! We will scan your Wyoming business’ mail daily and upload it directly to your online account, where you can access your Wyoming mail anywhere in the world. Mail that arrives to your unique Wyoming mailing address at our commercial office will be scanned and forwarded into your online account the same day it arrives—you’ll get your Wyoming mail instantly! Online accounts are all secured with 256-bit encryption and are hosted on a secure in-house server. We are also the only Wyoming mail forwarding company that owns our own building, meaning your mail is safe online and off. One of the first steps in creating a substantial presence in Wyoming is obtaining an address. We’ve got one for you! Get your own, physical Wyoming mailing address today! What we offer at Wyoming Mail Forwarding is choice! While all options include your own unique Wyoming mailing address, your mail forwarding service depends on how much mail you want forwarded each month and what options you choose. That’s right! We’ve got a free Wyoming mail forwarding package. If your business just needs a mailing address and does not intend to receive any actual mail, we’re here to help. If your business does receive any mail at its Wyoming address, you’ll be charged $10 an item. 20 mail items forwarded for $100 a year. Includes daily scanning. You choose whether we scan your mail or forward the original on a weekly basis. If you receive more than 20 mail items in a year, no problem—each item is an additional $5 scan/forwarding fee! $50 deposit required. $10 a month Wyoming mail forwarding package includes daily scanning; 5 items scanned to your online account each month. This option is perfect for businesses that receive mail irregularly each a month and wants to manage their Wyoming mail electronically. Includes daily scanning; 10 mail items scanned and uploaded to your online account per month. 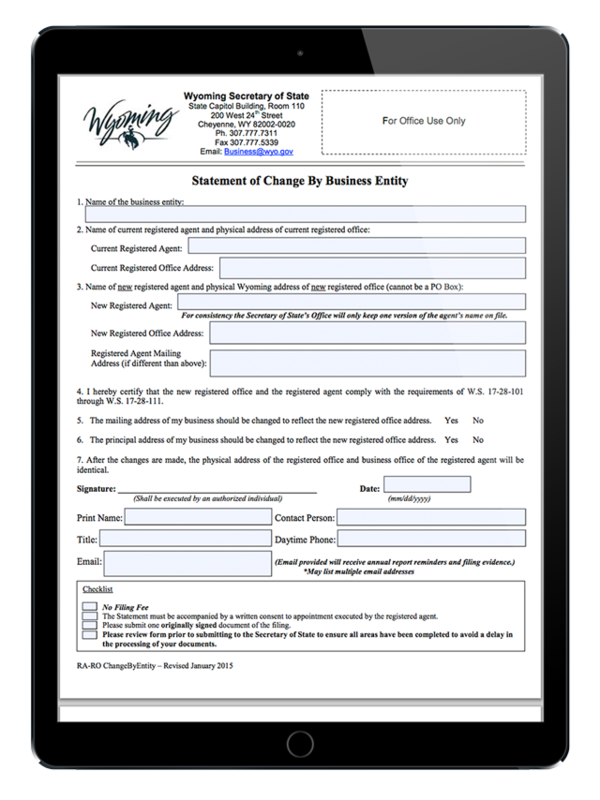 Ideal for small businesses and individuals that receive minimal amounts of Wyoming mail on a regular basis. Includes daily scanning; 15 items per month. You choose whether we scan your mail for electronic Wyoming mail management or we will scan front of envelope and forward originals through the mail weekly for no additional charge. Ideal for businesses and individuals seeking privacy and discrete Wyoming mail forwarding services. If you’re seeking Wyoming nexus for your business, one of the most important aspects of achieving a substantial presence in Wyoming is having an address. For $50, you can sign a lease to rent space in at our Wyoming address. Lease and address will provide your business all necessary requirements to apply for a Wyoming Sales Tax License. This option includes our $30 a month mail forwarding package (15 items a month, choice of scan or scan and forward). You mail will be scanned and uploaded electronically and sent to your online account as soon as we receive any mail on your behalf. What is Wyoming Mail Forwarding? Wyoming mail forwarding is a service in which mail delivered to a client’s virtual Wyoming mail address is forwarded to the client’s designated address. That’s what we do! When you sign up for our service, you choose your package and receive a unique Wyoming mailing address just for you and your business. Whether your LLC or corporation needs Wyoming mail forwarding for 30 pieces of mail a month or just five, we’ve got the right Wyoming mail forwarding plan for your business. Choose the Wyoming mail forwarding plan that best suits your business and get your own Wyoming address! Our business is focused on your Wyoming mailing needs. Whether you need Wyoming mail forwarding services for yourself or a Wyoming LLC or corporation, we’ve got a mailing receiving and scanning option for you. When you hire us for mail forwarding service in Wyoming, you’ll be given access to your secure, online account and your business’ new, unique Wyoming address. When we accept mail for you or your Wyoming business, we will initially scan the mail and upload it to your account minutes after we receive it. After we forward a digital copy of your mail to your online account, you will be able access your Wyoming mail anywhere you have online access. If you’ve selected a package that includes forwarding of original copies through the mail, we will forward the original mailing we received to you on a weekly or monthly basis. (With some of our options, you can choose whether we shred, forward, upload, or hold your mail for you). Who needs mail forwarding service in Wyoming? Does all mail count toward monthly mail forwarding totals? No. 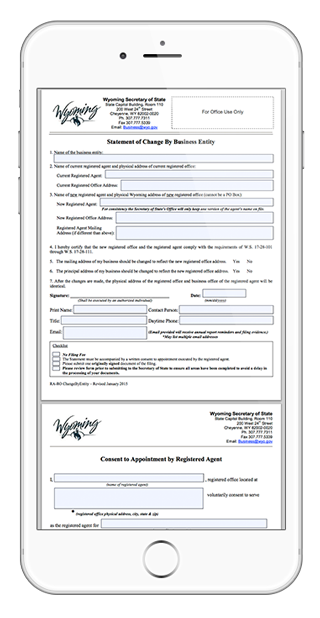 If you hire us for Wyoming registered agent service and we accept Service of Process or official mail from the state on behalf of your business, those items we receive as your registered agent will not count against your monthly total. Do you forward junk mail and does junk mail count against my monthly total? No. All solicitation junk mail is shredded when we receive it and does not count toward your monthly mail forwarding quota. Can I use your address as my business’ address? No. When you choose a Wyoming mail forwarding service, you will be given your own address at our building in Sheridan, WY. This way there’s no confusion whose mail is whose. Can I order a Wyoming phone number with a mail forwarding package? With Wyoming Mail Forwarding, any client can get a Wyoming phone number with any service they order for only $10 a month. Getting a Wyoming phone number has never been simpler, or less expensive. We are a full-service, business office center dedicated to your business’ Wyoming mail forwarding needs.